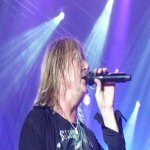 Def Leppard singer Joe Elliott was interviewed by 94.5 WXKR radio last month to promote The Art Of McCartney and talked about 2015 tour/album plans. Joe and album producer Ralph Sall talked about The Art Of McCartney album, recording songs by Paul McCartney, putting the album together and Def Leppard's plans for 2015 (album/tour). Joe says the 2015 world tour should start from "about April" and go through to the end of the year. Joe had previously said the tour would probably start in Australia/Japan and then repeated this in September also mentioning New Zealand. KISS have seemingly ruled out shows with Lep with their own solo dates in March/April. Joe recently said (when talking about Vivian's health) that they "need him back by April". 11 shows have so far been announced for the 2015 world tour. The latest show in Vilnius, Lithuania was announced yesterday. Listen to the full 4 minute interview clip via the link below. "Yeah. We are currently recording a new album. Which should be finished by Spring time, let's say - should be ready for Spring. And then we're gonna be touring pretty much from about April through to the end of the year."